Throughout the year TB and I meet with a group of friends for Dinner Night. The meal is held at each of the group?? ?s houses in turn and the hosting family sets the theme. This weekend it was our turn to host and our theme was fruit and vegetables. As the size of the group is now somewhat larger with children growing up and joining their parents at the table the set-up for the event can be a bit of a challenge for a suburban lounge-room. As it was we had to stick 3 tables together to fit everyone one in. I also decided to do some floral decoration and attempted to channel my late Aunty D, who was a florist ??? I think there might have been some static on the line. However, I did manage to get some theme material into the centrepiece by using asparagus and carrot fronds as the greenery in the arrangement. 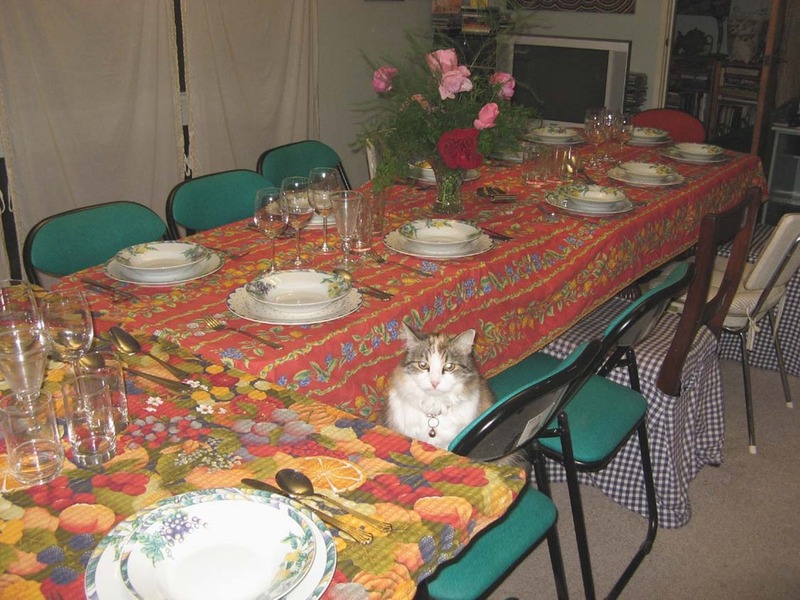 The cat, who is not fond of large gatherings, decided that she?? ?d give the table setting the once over, before she retreated to hide under the bed for the evening. 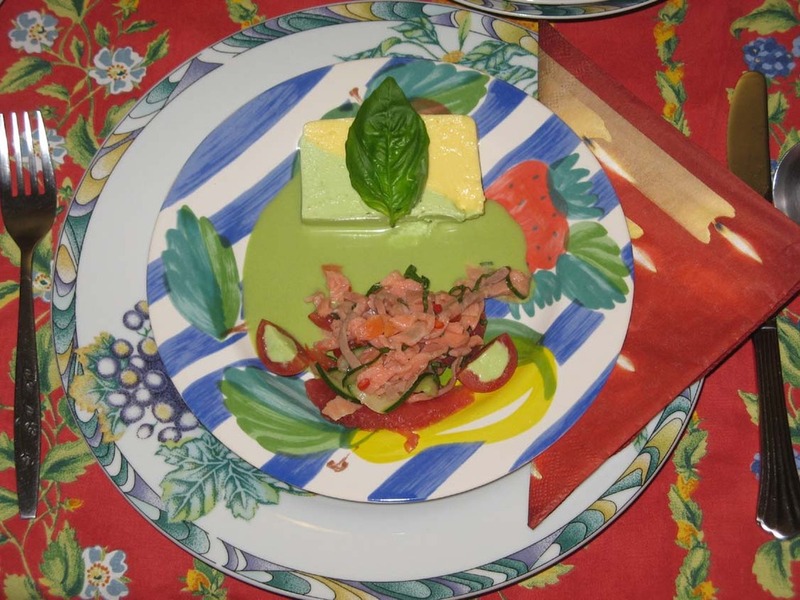 On Dinner Night the number of dishes in each course changes depending on who does what. This time we only had two desserts, which for our group was some sort of record. We generally have a break between mains and dessert, taking a walk around the neighbourhood to aid our digestion. The prize for the best presentation went to Mr F?? ?s salad. The mango and avocado parfait was really creamy and we were all impressed by someone who would take the time to stuff a cherry tomato. It was a lay down misere that TB got the guernsey for the most unusual dish with his beetroot ice cream. You can blame Gil from the team at River Cottage for that idea. On the night everyone, including the younger members of the team rose to the beetroot ice cream challenge and only one person faltered. Quite a good result. I must say that having tried the ice cream as it came out of the machine the day before I was not convinced it was a good idea. 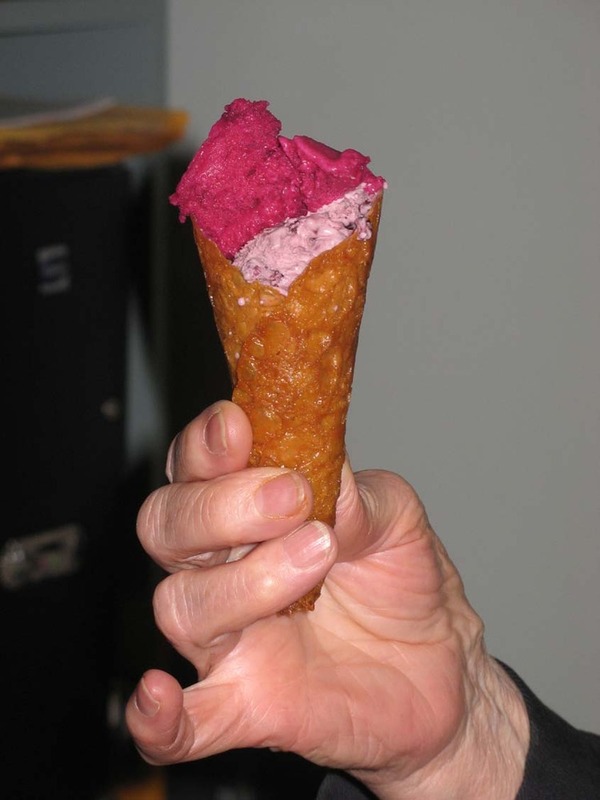 On the night, and having had even that small amount of extra time in the freezer the sharp beetroot flavour had mellowed and was really enjoyable. The rainy evening made eating the main course dishes a real pleasure. It was a reminder though that our lovely autumn weather will not be with us for long. 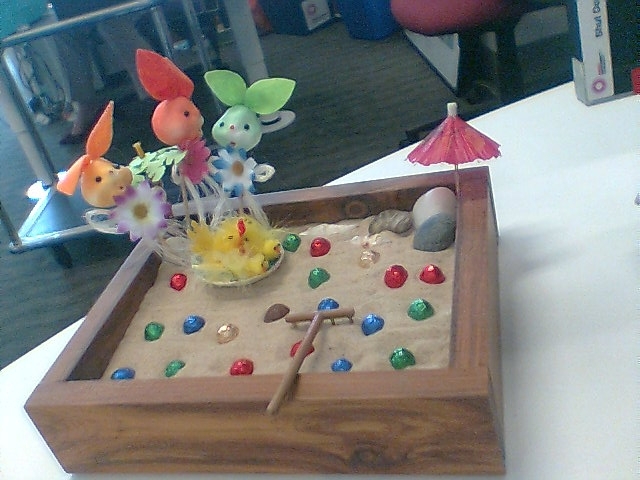 My friend Bishlet may well regret that she ever brought her miniature zen sand garden into the office – for while she is not there and when the workers get bored all sorts of things can happen. So far there have been themed interventions for Christmas and Easter. 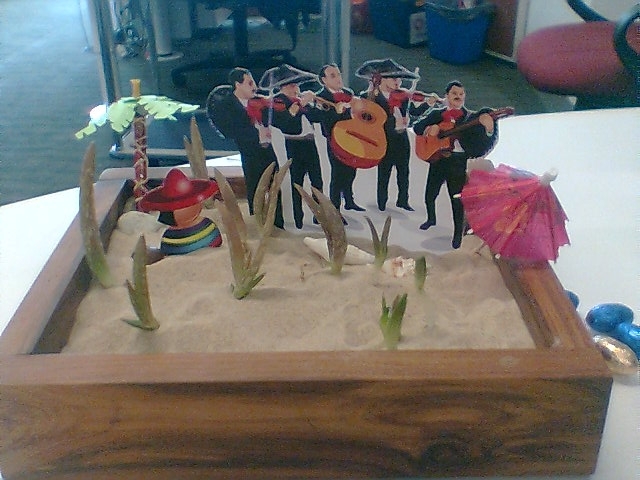 However last week things took a different turn when someone realized that their baby aloe vera plants would make a perfect desert scene! (and no it wasn?? ?t me). I?? ?m not sure, but I think this may be one of the smallest guerrilla gardening interventions you may ever see! 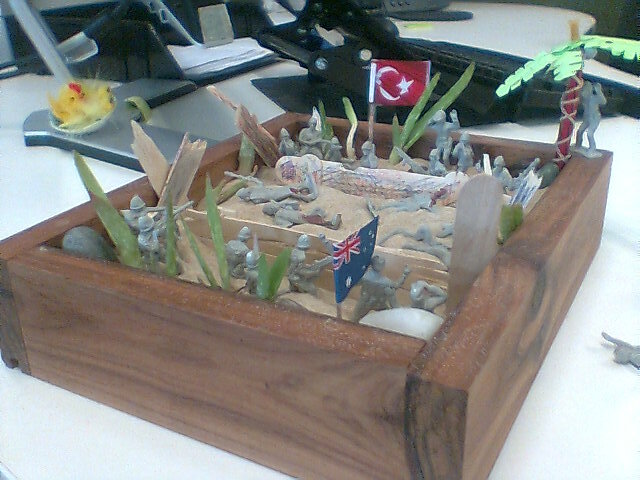 And now there is Anzac Day! It’s persimmon time (or kaki for those who prefer the Japanese term) and we have access to plenty of fruit via our friend’s Mum who lives several blocks away from Chez Fork. We are happily eating the bletted fruit but are also exploring drying persimmons Japanese style.By way of explanation the fruit of the astringent varieties of persimmon must be allowed to go beyond ripe in a process known as /bletting/ before they can be eaten. This process is also applicable to other fruits such as medlars. I thought that this term sounded like something from Old English but discovered via Wikipedia, that is in fact a fairly recent borrowing from the French, coined by John Lindsay in 1848 in his book /Introduction to Botany/. 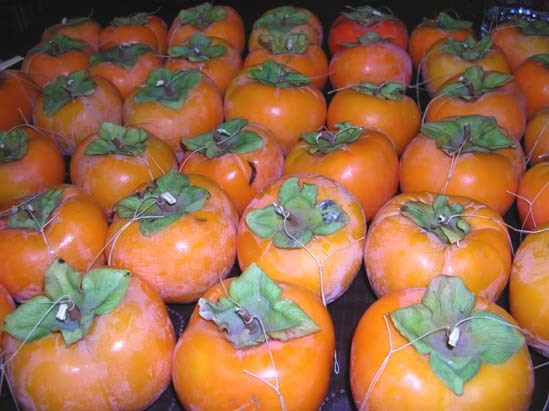 As for the Japanese they traditionally preserve persimmons by peeling, sun drying, kneading and brushing them, over the period of a month to produce a naturally sugar-coated product. These end up being a highly-prized, not to mention extremely expensive gift item. Given the amount of effort we?? ?ve been through so far just to get them to the hanging to dry stage I think the cost is quite justified. Details of the history and the methods involved can be found via the links. I spent over an hour the other day tyeing strings to the stems of the fruit. I was halfway through tyeing loops to hang them by when TB pointed out that the strings were too long and wouldn’t fit in the drying box. As we do not have a house with lovely wooden eaves to hang our fruit from we have resorted to the insect-proof box we usually use for drying herbs. This needs to be taken out during the day and brought back in in the evening. There didn?? ?t seem to be much happening with the fruit but when compared the fruit we hung last week (on the left) and that which we prepared yesterday the first batch has already shrunk by about a quarter of it?? ?s original size. More sewing of seeds has been happening this weekend. I?? ?ve sewn the seeds of beetroot Tonda di Chioggia, the white and red-striped beetroot and also Beetroot Small Wonders. We also planted more kale Cavolo Nero and some more purple sprouting broccoli. The snow peas that got ravaged by the overnight munching a few weeks ago are starting to put on some new growth and I’ve also direct sewn some seed in the gaps between the existing plants. 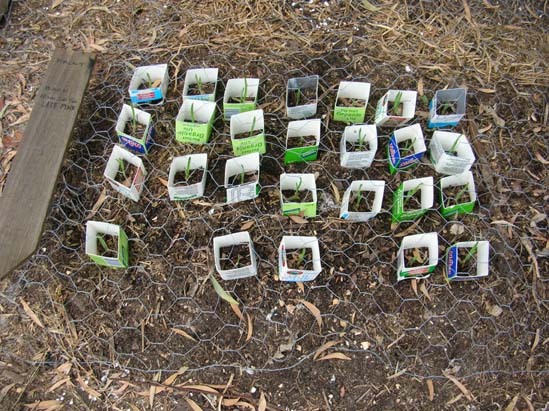 The seedlings that have sprouted from the bush pea Massey have also been transplanted into their permanent bed and again additional seed direct sewn – with plenty of barrier protection this time! If you ever questioned the existence of the Autumn flush in a Canberra garden then doubt no more. 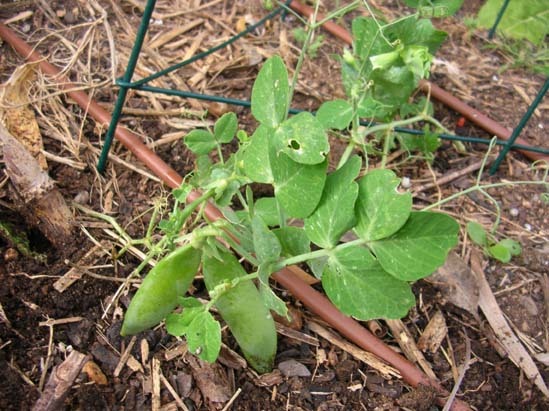 On the 1st of March I direct seeded some bush peas Massey and some broad beans Aqua Dulce into the garden. Today we actually have pods on the bush peas (check out the photo) and the broad beans are flowering (but I will not expect to get pods on these before the frosts). The intention of this planting wasn’t to harvest crops before winter but merely to get the plants into the ground and to a size where they could over winter happily but be at an ‘advanced’ stage to crop as soon as they could come spring. We are also still regularly harvesting tomatoes, but I anticipate there will be a large green tomato chutney cook-up before too long. On the non-veggie front my first Paperwhites (jonquils) of the season have started to flower. Sadly they have to stay outside because although I love the scent to TB they smell as if they were dog droppings. Our compost heap has also been the site of an experimental nest building – well tunnel excavation for nesting purposes – by a pair of spotted pardalotes. As our cat is far too successful a bird hunter we have erected barricades to stop the birds getting chewed while digging. I must say the pardalotes are very single minded and appear oblivious to all other activity while they are digging which doesn’t improve their chances. It is yet to be seen whether the hole meets the requirement and if they can put up with us, the cat and the crows and currawongs that live in our neighbourhood. I’m obviously not getting out enough these days. While visiting one of the few remaining commercial nurseries in Canberra over the weekend I was somewhat surprised to see a woman leaving with a very large potted kale (Cavolo Nero) plant. Indeed it was large enough to get a good meal off and still be a decent size plant. Further exploration revealed that for $14.95 you could also purchase well established broccoli and cauliflowers in 20 cm pots. At least brassicas should be hardy enough to survive the transplant at this size if they were well looked after. It seemed odd but really this is just a step along from selling advanced tomatoes. I had assumed that this was a clever move by the smaller nursery to keep ahead of the retail giants until my friend M said she’d just purchased some advanced Cavolo Nero, not quite as big as the nursery ones (and nowhere near as expensive), in individual pots at Bunnings. What will they think of next? Well I can tell you that too because the next thing that hove into view were a selection of black truffle-spore impregnated oak trees! Yes you too can give an unusual present to the gourmet in your life for a mere $145. The trees I saw were Holm Oak, otherwise known as Holly Oak (Quercus ilex) one of the trees traditionally used as a host to grow truffles. You can keep these in quite large containers or even as a hedge but do be warned that according to Wikipedia they can grow up to 27 metres tall, so probably not a specimen for your courtyard garden. The producers of these trees do say that it will take several years for the truffles to be produced and that you should sniff the ground around the tree in winter so you can tell whether truffles are present. Might be hard to explain that behaviour to the neighbours! Meanwhile at Chez Fork TB has been labouring manfully to convert last years polytunnel into this years ‘glasshouse’ (polyhouse?). TB has been suffering severe glasshouse envy ever since we visited the Stirzaker’s Open Garden?? . As you can see the structure is just about there, minus the plastic sheeting. You can guess who was responsible for the colour scheme! TB has also done further major digging for the new beds, although we are still in some discussion over the placement of paths – all in good time. I think I’m finally getting to grips with planting a sufficient quantity of plants to provide a reasonable return. I planted out 30 broad bean seeds Aqua Dolce (otherwise known as Leviathon Longpod) an heirloom variety from the 1840s.I’m hoping for a good germination rate. The broadbeans will be the first crop to go into the new beds. ?? ?walk into the shrink wherever you are ,just walk in say “Shrink, You can get anything you want, at Alice’s restaurant.”. And walk out. You know, if one person, just one person does it they may think he’s really sick and they won’t take him [in the draft]. And if two people, two people do it, in harmony, they may think they’re both faggots and they won’t take either of them. And three people do it, three, can you imagine, three people walking in singin a bar of Alice’s Restaurant and walking out. They may think it’s an organization. And can you, can you imagine fifty people a day, I said fifty people a day walking in singin a bar of Alice’s Restaurant and walking out. And friends they may thinks it’s a movement.??? (extract from:http://www.arlo.net/resources/lyrics/alices.shtml). Well perhaps it?? ?s not quite that simple but if you are interested in how the organic gardening movement took off in the last quarter of the 20th century, or you want to find out about some more about guerrilla gardening then there are two books I?? ?ve recently read which I can highly recommend. The books are Organic Gardening: The Whole Story by Alan and Jackie Gear (Watkins Publishing, London, 2009), and Guerrilla Gardening ??? A Manualfesto by David Tracey (New Society Publishers, 2007). Both books focus on how small numbers of people with big ideas get their story out to the rest of the world and spread their message as they go along. In the early 1970?? ?s Alan and Jackie Gear answered an ad in the paper that saw them take up positions at the Henry Doubleday Research Association (HDRA), founded by Lawrence Hills in 1958. They stayed with the HDRA (now known as Garden Organic) until they resigned in 2003. As such they were in the right place at the right time, working with other HDRA staff and members, to progress the concept of organic gardening throughout the UK. In the 1980?? ?s they were responsible for creating Britain?? ?s first organic demonstration garden at Ryton. I think what surprised me most while reading this book was the relatively short period of time it has taken organic gardening, as represented by the HDRA and its members, to become a major movement in the gardening world. This is due in no small part to the HDRA?? ?s insistence on scientifically based trials to support and develop their approach. Alan and Jackie were also involved with promoting the concept of organic gardening, which is more than just gardening without chemicals, to the ordinary gardener. In part they did this through the pioneering TV show All Muck and Magic? which introduced the wider British public to the principles of organic gardening and also through a huge amount of effort and fund raising under Jackie’s supervision to develop various demonstration gardens throughout the UK. While this is not a ‘how to’ book there is plenty of useful information to be gleaned on the way. At the end of the book there is a good list of contacts in countries around the world, including Australia, should you want to get active. Unfortunately from a quick check of its web site the Australian arm of the HDRA seems to be rather moribund. You might be better served visiting the main Garden Organic website where there is a lot of information available even to non-members. It is clear that what the HDRA achieved over the time that Alan and Jackie were at the helm is a monument to their dogged persistence to their goal, and this was based on their youthful commitment to a big idea. If this sounds all too worthy then be relieved to know that Alan and Jackie tell their story with a light and entertaining touch. There is a similar mix of ideals and persistence displayed by the protagonists in David Tracey?? ?s book on guerrilla gardening. It is in part a history of guerrilla gardening from the perspective of the north-west coast of the US and Vancouver, Canada, where David is a landscape architect, as well as a manual on how to become a guerrilla gardener (gg). Surprisingly you can become a gg without having to even go out at night wearing dark clothing! (and don’t even consider that excrable show that briefly appeared on Australian TV as a real example of what guerrilla gardening is about!). All sorts of people do it. You can do it by yourself or with a group of friends. You can choose to weed and water a neglected plot, plant a vertical vegetable garden on a chain link fence or set up a community garden. For heavens sake they even talk about working with your local council to achieve your goals! Most importantly David sees gg as a way of connecting not only with the environment, but also with your local community. David’s light touch with his prose which makes this book a very easy read. In his section ‘Guerrilla gardening is fun’ David asks “How did environmental politics get so earnest and dull? Has there ever been a rallying call more numbing than “sustainability”? Who decided that anyone working on environmental issues must appear grimmer than the consequences involved?” David draws on his own experience as well as providing interviews with a wide range of people, from activists to used-car salesmen, who’ve taken it on themselves to do something to improve their local spaces. The book includes lots of practical information on how to go about your chosen task, including what to if you get stopped. 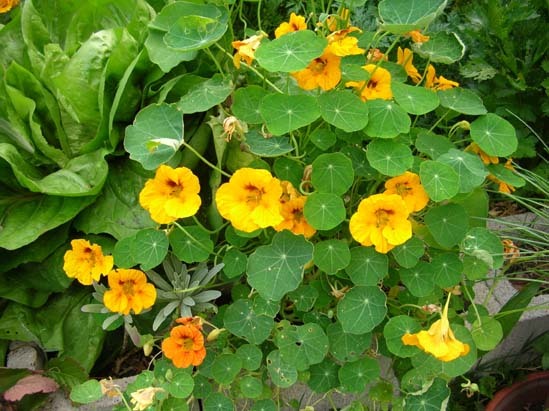 One note of caution I would add is that some of the ‘power plants’ that have been suggested for use, such as the California Poppy are already an invasive pest species in Australia and should not be encouraged. Ditto the Leyland Cypress which may not have any formal pest status in Australia but is considered a very unwelcome specimen in gardens across Europe. You may find that you will develop a more active interest in guerrilla gardening after reading this book. In which case I may see you out there on the streets. When we were at Lambrigg the weekend before last TB bought some packs of garlic from the Gundaroo Tiller – Allsun Farms stall , the Late Pink and the Hard-Stemmed Red, which he planted later the same day. Well blow me down if the Hard-Stemmed Reds aren’t already leaping out of the ground! We got an even greater surprise when we were doing the standard garden tour for our friend’s Mum on Monday when we saw that our saffron was already flowering! Three flowers already open. We made a very bad decision and didn’t pick them on the spot. When I went to pick them this morning another garden gourmet had eaten the pistils of all three flowers. At least they didn’t get the two flowers about to open because I got them first. 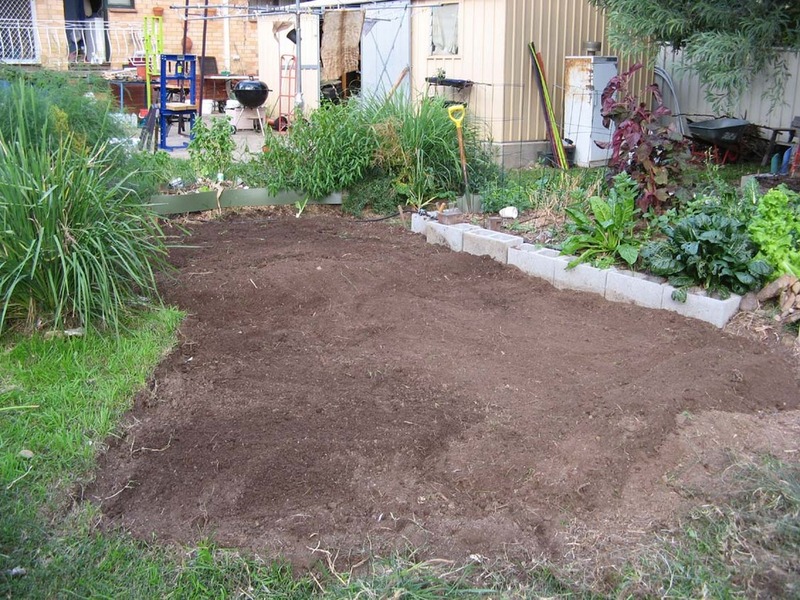 We hereby announce the commencement of the Voted With Our Forks Silver Jubilee Garden Renovation scheme, or the Glorious Motherland Agrarian Revolution as Performed by the Peasant Cadres of Canberra ??? choose whichever revolution you prefer, it?? ?s that momentous. Yes, after two years of growing ever more vegetables and making garden beds to accommodate them, at random throughout the yard, it finally dawned on us that it was time to get organised. (Well you don?? ?t want to rush these things). Friday had been spent pleasantly pottering around the garden but by mid-Saturday morning we?? ?d had somewhat of a revelation, (in which thankfully no strange horsemen were involved), we needed to redesign the back garden! 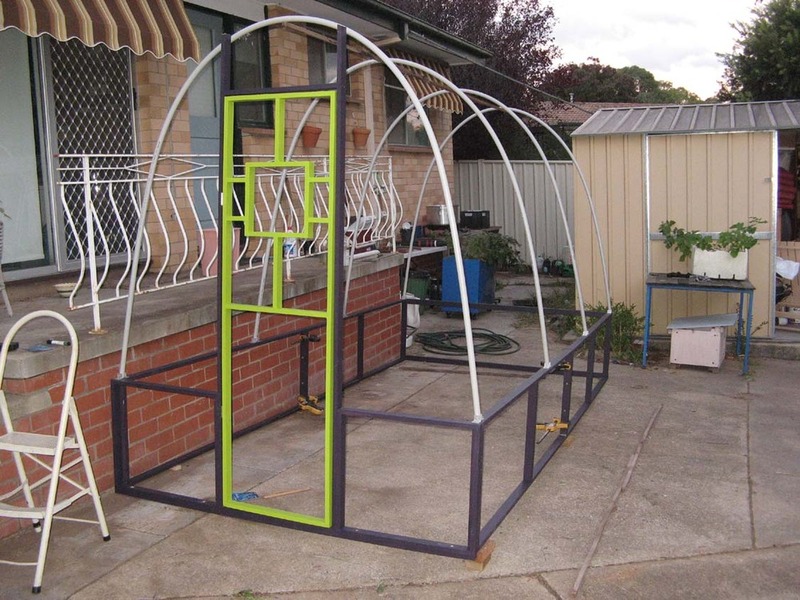 I think TB just about fell off his chair when I said I thought we needed a more regular structure to our garden beds which included a system of paths for easy access for both people and wheel barrows. In my defence I did point out that those of our current garden beds that were of a symmetrical nature did manage to look pretty wild by the end of the growing season so I wasn?? ?t going to turn into some lover of garden beds displaying evenly-spaced alternating red and green lettuces (which is actually how Monty Don has one of his garden beds, quelle horrible surprise!) any time soon. Thankfully we have both agreed on a starting point for this work. Work from the back forward! Yes there is a strange but compelling logic to all of this. Along our back fence-line are a number of young apple trees that TB will start to espalier this year. The current crops in the garden beds in front of the apples are just about to finish so once they are done we?? ?ll move the beds forward to give the apples some more space and start re-developing that area. We?? ?ll have some ???givens??? we?? 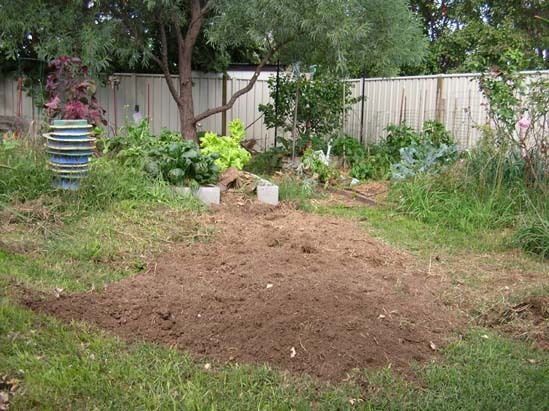 ?ll need to plan for beds for perennials, such as rhubarb, asparagus and sorrel and a place for a chook shed. While some of the existing back garden plantings will remain, particularly the trees on the western boundary of the garden, some other plants will have to be moved. These include Dianellas (blue native lilies) and some native grasses which I?? ?m planning on transplanting into the front garden which is an all native garden. Out in the front garden I?? ?ll be integrating the wildflowers on the nature-strip back into the main part of the garden. Obviously all of this will take time; in fact we can?? ?t see that it will be finished before the end of the year. However that may be a quite fitting outcome as 2011 will make 25 years in residence at Chez Fork. I spent most of the day outside today catching up with a whole lot of end of summer tidying-up. First I tackled painting the remainder of my first batch of garden stakes. Having run out of ‘Burnt Brick’ I segued on to a very deep greyed pink called ‘Zircon’. I think I’ll take a jump over to some different colours for the next batch of stakes, chartreuse perhaps. It dawns on me that getting your little forklets to paint garden stakes is possibly a good way of encouraging them to take an interest in the garden, not to mention another exciting way to get messy. The heavy rain that interrupted my stake painting spree on Tuesday also stopped me from getting around to that other boring but necessary job – the mowing. Unfortunately for us the currently dominant plant in our ‘lawn’ is paspalum going to seed, yuk. So in hope that the rain will hold off so one of us can mow tomorrow I decided to get a head start in cleaning up a whole lot of stuff loitering around the grounds of Chez Fork. Of course we only have bits of stuff lying in the long grass that will jam or break our mower. Mainly this consisted of kilometres (or so it seemed) of various diameters of irrigation pipe, the large pipe last used to drain our washing machine water on to the afore-mentioned ‘lawn’ and various pieces of one dismembered polytunnel. All the tubing has been tidied into very large wreaths of plastic hanging at the back of the shed. On the upside I uncovered a whole lot of new stakes to paint as I tidied my way around the place. Another not so happy discovery was that the snow peas I planted out the other day have been seriously munched on by something. Those planted in the Red Poles bed have had most of their leaves removed as they were sprawling across the ground rather than twining up the string. Foolishly I’d neglected to provide them with any barrier protection as I thought they were too big to need help. Some others planted nearby were eaten to the ground. I have carefully tied some fine soft weaving wool around each of the plants so what leaves they still have are no longer within easy reach of their munchers – I hope. I’ll leave you with two pictures that were accidentally left out of recent posts. 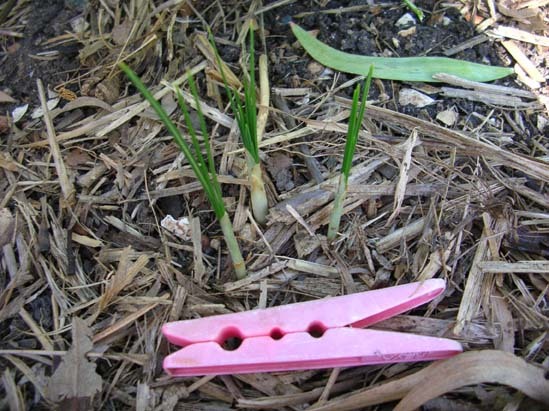 The first is a photo of our saffron crocus bulbs as they currently are (previous photos were from last year). Secondly a Lambrigg leftover, a picture of the Strezlecki Apple display. You can see they have fared better this year in Gippsland than the local apple growers have in Canberra.